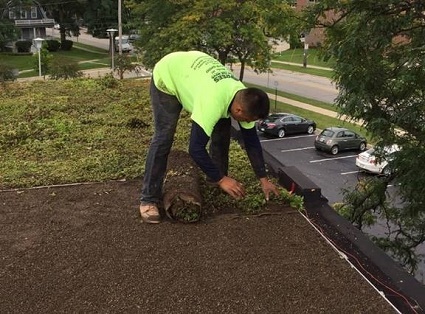 The City of De Pere, Wisconsin decided to convert their worn-out EPDM roof into an environmentally-beneficial roof-top garden. The old, worn-out mechanically-attached EPDM roof was in constant need of repair and ready for replacement. The City of De Pere were intrigued by the long-term benefits of a green roof, after speaking with Hanging Gardens, a Milwaukee-based green roof design firm. A structural analysis confirmed the roof deck and structure could hold the weight of a green roof. Rather than go the traditional route and tear off the old roof, install new expensive insulation, and then a new membrane, Hanging Gardens informed them of the TRITOflex restoration option. It made perfect sense. 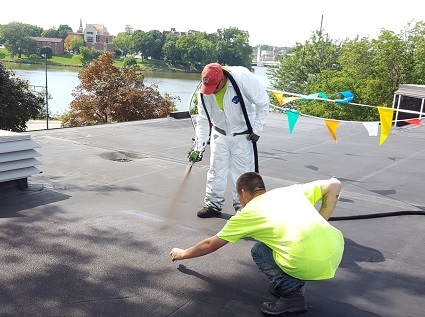 The City could use their existing EPDM roof to their advantage, rather than waste it, by adding 80 mils (2 mm) of highly flexible, durable, and ponding water resistant TRITOflex rubber. As a seamless, self-terminating liquid membrane, this would eliminate traditional failure points of seams, overlaps, and flashings. Any other liquid-applied membrane would have not be acceptable to install a green roof over. After a good pressure wash, TRITOflex was spray-applied by Zander Solutions, a Certified Triton Applicator, to 90 mils (2.2 mm) dry in one coat over the existing 9,000 sq. ft. EPDM roof. EPDM rubber is naturally a long-lasting, strong material. With the addition of TRITOflex on top, not only did it save the city money, but provides them a “bullet-proof” roof for decades. TRITOflex is impermeable and will withstand ponding water indefinitely, making it the ideal solution to keep a building watertight with a green roof over top. The total system included the ILD electronic vector mapping leak detection system, drainage mat, filter fleece, growing medium, and sedum mats. There is also a video taken by the local new station showing some of the green roof here: http://fox11online.com/news/local/green-bay/de-pere-city-hall-installs-green-roof.